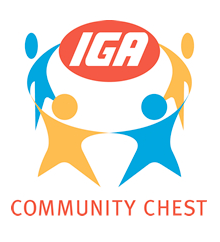 Every day across the country, IGA Community Chest raises funds to support local communities, charities and other worthwhile causes. Next time you are in our store, look for the special Community Chest tickets on the shelves to help you identify which products help put something back into our local community. That way you’ll be a local hero too. Our goal is to particularly support kids in the area with their favourite sporting and recreational activities and of course support those local community organisations you don’t hear about everyday. We are also actively involved with sponsorships, fundraising and other community events. Spano’s IGA also supports our community through our Community Rewards Program. Members of our My IGA Card Rewards Program may choose to donate all or a percentage of points they earn while shopping with us to a local community group the store supports. These points will then be converted to cash and donated to the organisation every 12 months. Every time you purchase a Community Chest product, you are helping to support these organisations, as a percentage from each product sold is set aside and donated to these organisations every quarter. If you are part of a local not for profit community organisation, feel free to talk to us about any opportunities.